We found this place while making a quick pit-stop for lunch. The roast duck (slices of roast duck) dressed with a thick black sauce with rice and some cucumber slices on the side was tasty. But I usually steer clear from these stalls as I find the all meat dish too overwhelming. 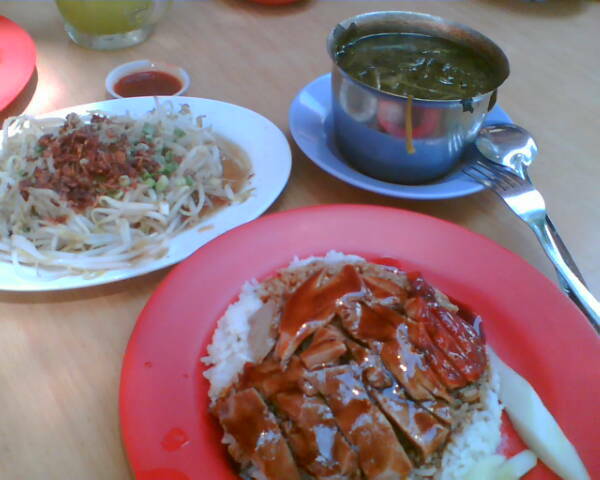 Good thing Johnson Duck had a second stall right next to it that had a rather extensive menu, and we managed to put together a complete meal with double boiled watercress soup and vegetables (bean sprouts). Ghim Moh Food Center makes for a rather satisfying visit if you are in the mood for good ole hawker food. This place is also known for its fried kway teow (flat rice noodles fried with eggs and sweet dark sauce), Ipoh hor fun, chew kueh (steamed rice cakes), ... If only we had the stomach to try it all! YAHx..johnsonduck foods are great..i like their management in this stall..unlike the one behind..oso sellign ducks.. they always have long queues..but their ducks are dry and oily..i dun reli like..and i wonder y their queuse are always so long..i guess the workers purposely work slowly to make long queues to attract more customers..i rather try johnsonduck more worth and easy with great food!.